The phenomenon of water molecules spontaneously migrating through a permeable membrane being used to separate a dilute solution from a concentrated solution until the concentration in both is uniform is called osmosis. After a while the water level on one side of the membrane will be higher, the difference in height is called the osmotic pressure. When pressure is added, to the higher level side, that is greater than the current osmotic pressure the flow will be reversed. This reversal allows the contaminant solution to be further concentrated and produces purified water. The adding of pressure to enact the reversal is called Reverse Osmosis or RO. Reverse Osmosis can typically remove 85 to 99% of most mineral contaminants present in water. This can be more easily represented by using an example water source containing 1.0 mg/L of mineral contaminants. Running this water through a reverse osmosis system can potentially produce water containing only 0.1 mg/L of these same minerals. 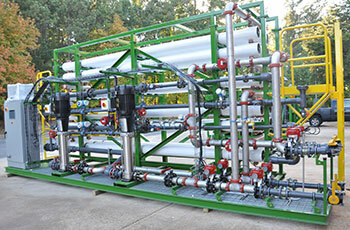 Reverse Osmosis (RO) uses membranes with very small passageways and can thus be quickly clogged by attempting to process water with high turbidity. It is important to put in place a pre-filter before the RO with a larger pore size to capture these larger solids before they enter the RO system. Pre-filters such as bag filters are relatively inexpensive in comparison to RO so are an essential part of any RO design. The feed water must be pretreated to remove the suspended solids, adjust the pH level and add an inhibitor to control scaling that may be caused by calcium sulphate in the feed water. A system pump is used to raise the pressure of the pre-treated feed water to an operating pressure appropriate for the system membranes and the salinity of the feed water. The RO membranes then inhibit the passage of dissolved salts while allowing the passage of the desalinated produced water. This is where two streams are produced being (1) a fresh water stream and (2) a concentrated brine reject stream. The water can then be further treated for use as drinking (potable) water or other industrial uses requiring ultra-pure water.